There are a few ways to complete this lesson, however, it is best to ask students questions and let them drive the conversation. Objective: To get students to reflect on their own stereotypes. Note: I use this lesson on the first day of school when teaching US History. This video has been edited, one word removed.. Ask the students what the narrator is talking about. Pause the video again after the narrator is introduced. Discuss their reactions. If you choose to continue watching the rest of the video: Point out the relationship between the Hawaiian and the Mainland Japanese Americans. You may also want to point out the importance of learning history (from different perspectives). It took 30 years for vindication for refusing to fight. 2. Watch: "What Kind of Asian Are you?" Who is more offended the man or woman? Why? Explain. Who do you think this situation happens to more often? Why? Allow students to discuss and reflect. This is just a link to the video until it can be updated on this website. 3. 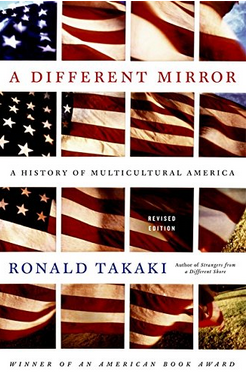 Read: "A Different Mirror: A History of Multicultural America"
He tells a story about his experience with Asian stereotypes in America. Note: This can be before watching "What Kind of Asian Are You?" Note: This is an optional clip. The lesson can still be effective without this class. If desired, this is a great clip to talk about media literacy, copy right, and stereotyping. Discuss the stereotypes and any of the other issues brought up in this clip. 5. Watch: "America the Beautiful - Coke Commercial"
Ask students to discuss what they think about it. Does this reflect America? Why or why not? 6. Watch: "Bridge of Spies" - "The Rule Book"
Note: The link above is not edited. Have students discuss this and why we study US History and what it means to be American. Discuss the multicultural history of America, it is not just the European perspective.